This Chapter is about Cache Operating Modes that help overcome Side Effects in Scenarios of massive File copy and Image Backup. 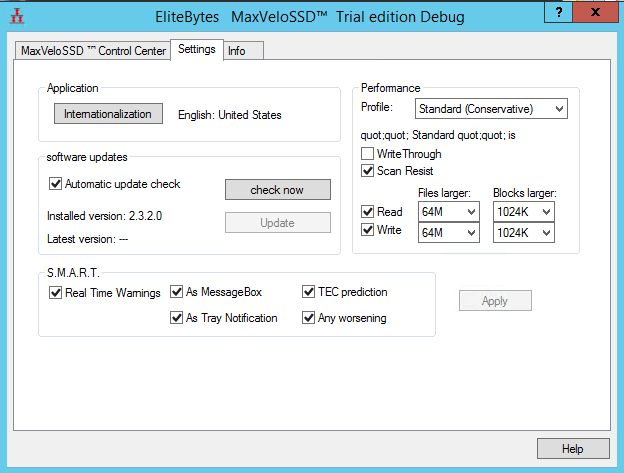 These Modes also reduce wear and tear of the SSD. User adjustable Operating Profiles allow easy and flexible Settings. From Highest Performance down to the most Conservative Operation Mode. In earlier Versions running an image backup while the Cache is active exhausted the Cache. Also copying big files exhausted the Cache. âScan Resistâ protects the Cache Content against such. Write Caching boosts Write speeds. With âWrite Throughâ there is no more Write Caching, all is written directly to the Disk. Reducing Wear of the SSD. Also âWrite Throughâ is considered safer in terms of Data protection. The software will activate a âWrite Throughâ Override when the Write Cache fills up. Write Through: Disables Write Caching when active. Scan Resist: Enables Scan Resist for Read and Write. Read: Enables Scan Resist for Read. Write: Enables Scan Resist for Write. Files larger: Files consist of 1 or more Sequences of Blocks ( Cluster runs ). Any File / Sequence that is at least the displayed length will be cached. Otherwise not. A high value will allow good Read / Write caching. Blocks larger: Any Block that is at least the displayed length will be cached. Otherwise not. A 64 KB Read Block Size has proven to be a good value for Backup Software like Windows Backup and also protects against large File Copy from the Host System . A 1 MB Write Block Size has proven to be a good value to resist against large File Copy to the Host System.